I used a thick, clean brush, rags and my hands to get the oils into the wood, then let them soak in the outdoors for a few days. Some pieces drank up a few coats. The trickiest pieces to get oil into were two balsa-wood boats. Each had many small pieces, cross bars for the imaginary fishers or passengers to sit on; three-piece rudders; small, slender oars and long polished sticks to attach sails. They were models of the Maldivian dhoni. 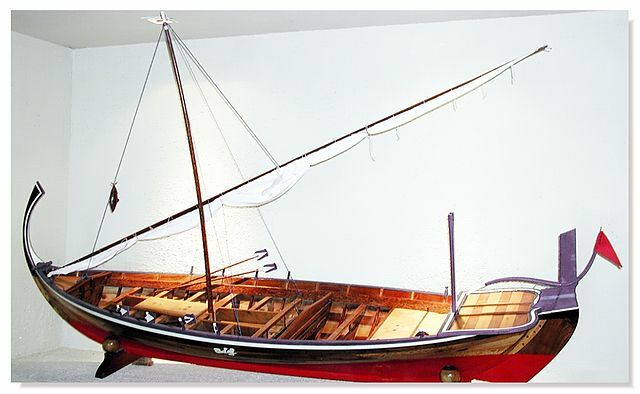 Museum model of a Dhoni, similar to Claudia's unpainted models. Photo by BadrNaseem. Like the original dhoni, each was made without nails or glue. They were held together by tiny wooden pegs, some not much bigger than a splinter. Oiling the wood brought it life, like a bucket of cold water over your head on a hot day. But some of the tight junctions in the boats were loosened by the oil. The boats will have to find new ways of fitting together as the oil soaks into them. He gave us this advice as he used a pocket knife to carve the bark edge off an exquisite, hand-carved decoration from the German Christmas markets. ‘See? It’s still nice,’ he said as he handed it back. I haven’t always found Customs Officers friendly. When I was a twenty-year-old kajal-eyed traveller from India, I had a single pair of shoes I put on to go through Immigration. Australian Customs cut my soap open and squeezed all my toothpaste out in a demonstration of the possibility that I had something hidden in there (what? Hashish oil mixed with toothpaste?). A few years later, when I was a mother, they ripped the coconut fibre moustache and eyebrows off a beautifully made and painted Balinese mask with characteristic efficiency. It was another reminder that something carefully chosen and bargained for at the market can be nothing but a dangerous object to the border guards. Customs Officers--fighting the fire ants. Australian Kamal Dutta (L) and Solomon Islands Officer Tammy Luitolo. DFAT photo. They are kinder nowadays, probably partly because I don’t scowl at them or smell like patchouli anymore. I have a better understanding of what they do, too. In Summer in Europe last year the fruit flies were awful. Too tiny to keep out of the house, they invaded and spoilt any organic material they could reach. They even got under the edges of the lid of freshly made mayonnaise. We experienced another pest, the ultra-tiny and uber-nasty fire ants when we were in Tonga. They made a nest of the electronic parts of a friend’s television; tried to get into my computer through the USB ports, too. In an unbalanced world, there are some animalcules we would like to keep off the Australian island. Over the past two months, while dealing with administrative tasks of her parents’ estate, in the midst of grief, Claudia worked to clear out and pack up her own life-long possessions from the family home. She had an attic room in her childhood home that she (and later we) returned to many times over the years. A corner of Claudia's attic room. Photo by Claudia. Her parents built the house. Her father chose the land from his father’s land and he and his dad built it together: fit to last two-hundred years. For Claudia’s parents, part of the satisfaction of staying in their own place was being able to keep treasures and interesting objects. They kept a place for their peripatetic daughter. The attic bedroom was cozy and private. It was still like the bachelor pad Claudia made in her teens, with a huge empty bottle of Metaxa (with a spigot on the bottle and unhappy memories of excess) in the corner. A stuffed white cobra—neck fanned with the stitching giving way and fangs looking delicate—guarded the entrance. Up in the attic Claudia had books and boxes of notes from her most recent studies: her heilpraktiker (naturopathic physician) qualification (from which she graduated about twelve years ago) and portfolios of art exercises from earlier days when she knew she was an artist. Along with drawings were paintings and sculptures from her teenage years. Some of the art was grim and Dali-esque. The end of a baked clay foot peeled into an open-toothed mouth with Rolling Stones lips and a clay cigarette. A sculptured hand, like Thing from the Adams Family, revealed anatomically correct bones under the terracotta flesh. A corrupt general scrubbed with oil pastels glared in the style of George Grosz. All young Claudia's work. 'The Last Cigarette' by Claudia. Some of the art was more conventional but still playful. Air-brushed seventies beauties, retro-style travel posters, a cardboard globe, a paper-mache kangaroo she made with her toddler niece, handmade orange sunburst rugs: the room overflowed with vibrant creativity. The best pieces of a colourful early nineties wardrobe slept in the kelly-green closet—jackets Adam Ant might have worn. The closet, which Claudia didn’t like—contrasted with the foot-wide orange flowers on the feature wallpaper. Orange poppy from the garden, like the wallpaper in the attic. Author photo. Big attic windows looked out onto the world—the garden with the forest behind, the street and the valley ahead. You could look out and down on it all. I got used to standing up from the bed without hitting my head. There was a dormer window in the little bathroom. The room was decorated with copper-coloured circular tiles. The toilet suite and the roll holder were Avocado Green. The latter was well designed to dispense paper with one hand in plastic that lasted over thirty years. The window looked up at the sky, encouraging greetings to the moon and Ursa major during nightly visits. She could tell me about the paper dispenser because in her early twenties Claudia trained as an Industrial Designer with a large car manufacturer. Even now, she’ll tell me what’s good or bad about the way a spoon or a kettle or an aircraft seat is made. She can’t help noticing. She escaped that job to work as a diving instructor in the Maldives. Many years later, that free-wheeling spirit married me and followed me home to Australia. I thought of all this as I cleaned and oiled the wood. Alongside the Maldivian boats, two other objects were outstanding. One was a mask from Tonga, carved by an artist with evident strength and talent. A big Pacific mask, hollowed out with an adze, it showed fierce faces of angry ancestors. It was a mask to make you behave. I never liked the idea that dead ancestors watched and disapproved of the living. We are born into enough weight and complexity without the judgement of ghosts. But as I filled the triangular cuts into the wood with nourishing oils it occurred to me that these ancestor's faces were protective, like the bunyips we have in Australia, that frighten children from the waterholes to keep them from despoiling the water or accidentally drowning. Perhaps these ancestors, from their between-lives perspective, see the seas rising now around their descendants’ island homes. Perhaps they are raising the alarm. Alarmed or alarming ancestors--the mask coming to life. Author pic. The mask was made of pale and dark grey wood, somehow twisted together by the one tree. The colours got strong under the oil. He became deep brown and blond entwined after the oil. The other impressive object I oiled was a wine-box. It was made by Claudia’s paternal grandfather, from rough-hewn wood. Applewood is common for boxes, but this wood responded to the oil by glowing deep red. I think it was cherry-tree wood. Her grandfather burnt his name into two sides of the box. It was from the days when produce, including homemade wines and schnapps were distributed around the neighbourhood. Claudi’s parents still did that. Bottles of her Dad’s homemade schnapps and her mum’s jams were left in the cool cellar downstairs. We don’t know yet what will become of the house. Perhaps another family will make their life there. Because the prime land of her ancestors is in short supply in Europe now, the house may be demolished and profitable apartments built there. Leaving the house, still so full of her parent’s lives, was heartbreaking for Claudia. The major part of Claudia’s work these past weeks has been sorting out her photographic collections. She's a photographer. Decades of transparencies, beautifully preserved slides, mostly of underwater and island life, had to be reviewed and sorted: thousands discarded, hundreds safely packed. Sketches from her adolescent and young adult artist-self were reviewed, collected and bound. Some were photographed, the originals let go—digital memories and inspiration can suffice. The decision-making was constant and overwhelming. Sometimes she brought me a book of poetry she'd found or a remarkable photo. Reading the poem, looking at the photos, was the day's highlight. That, and the garden in the evening. Claudia in her parent's garden. Photo by author. We’ve left the house now. Claudia’s treasured possessions are headed for the dock in a specially treated wooden box. The Customs workers at Bremen understand the needs of their Australian colleagues. Safe from wood-borer and other bugs, the mask and the wine-box, and the balsa boats are drinking up their ti-tree and spruce-flavoured oils so that they will be at their best when they arrive at the antediluvian port. Claudi’s books, letters, artwork and photos will smell like them when they get home. As well as the artist’s attic, the fragrance will remind me of the sunny terrace behind the strong house her father built, bordering the forest. Thumbnail photo of eyes painting by James Wainscoat.